Our flight leaves for Kuala Lumpur in two hours and 38 minutes. We've just enjoyed a rather nice meal of Moroccan tajines at the Chez Gérard brasserie here in the departure lounge at Heathrow. It's a bit expensive, of course, but we have some UK pounds to burn before we leave the country, so we'll be paying cash. With such a late flight, we had time earlier today to do some more exploration of the British Museum. We began with another leisurely morning, wanting to be as well-rested as possible before the long flight ahead. We rose at 09:00, M. had a shower, then we went for breakfast at Pret a Manger again, repeating the meals of the previous few days. Back in the room, I had a shower and we packed our bags or the flight. Then we left them in the luggage room of the hotel and checked out. We took a 91 bus to the museum again and began tackling the various rooms we hadn't yet had time to visit. We began with the African galleries downstairs. To get there we had to pass through a themed gallery on Life and Death in different cultures. 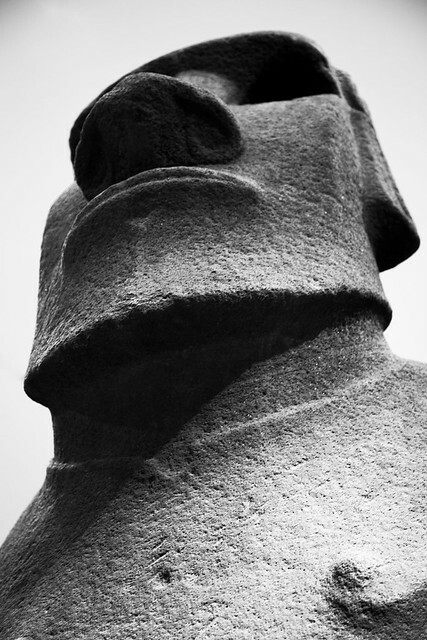 This contained Hoa Hakananai'a, an original giant head statue from Easter Island - a moderate sized one at only about 2 metres tall. The African section contained a lot of relatively modern pieces created in the 19th and 20th centuries: masks, chairs, drums, costumes, weapons, shields, and textiles in various patterns. 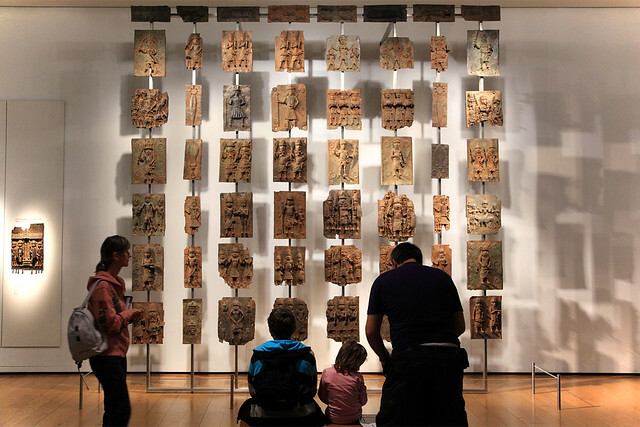 But there was also an impressive display of 13th century bronze plaques from Benin, each about 40 cm square and depicting scenes and characters in high-relief metal sculpture. Several pieces had nail holes in them where they had later been nailed to buildings. There were about 30 of these plaques. Another section contained clay pots and figurines and also carved wooden figurines, poles, and large decorative items. The next thing were galleries devoted to North America and Mexico. 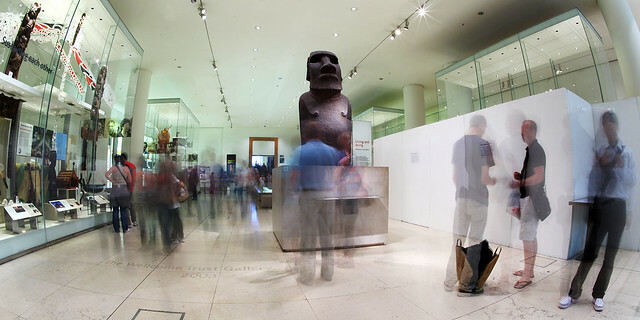 The first contained Inuit and Native American artefacts, and then the Mexican gallery was mind-blowing with Mayan and Aztec sculptures, figurines, jewellery, and carvings. There was a copy of a Mayan codex, but not a genuine one. But the jewelled turquoise ornaments, masks, and jewellery were amazing, glittering in rich blue and green accented by gold. 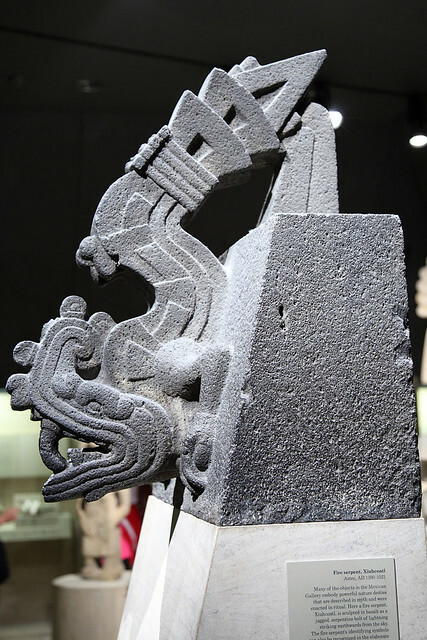 The stone carvings were also staggering, with one of Xiuhcoatl, an Aztec winged serpent representing lightning creeping down from a high perch, and several Mayan scenes carved in relief into large stone blocks. From this gallery we headed up to the upper floor to continue our exploration of Egypt, with some of the galleries that had been closed on Friday evening. This included the Coptic era, with Christian symbols mixed with slightly more traditional Egyptian looking items. 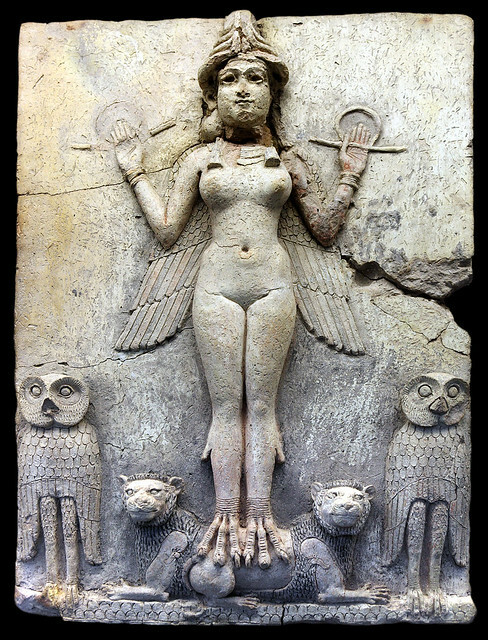 Then we proceeded to galleries devoted to ancient Mesopotamia, with artefacts as old as 6000 BC. Some were from the nigh-legendary city of Ur - where civilisation and city-living began. Several galleries explore the ancient Middle East - the cradle of civilisation - with items from what are now Iran, Arabia, and Turkey. These led into a gallery on prehistoric Europe, containing Neolithic, Bronze, and Iron Age artefacts. One item was a very rusty sword which was nonetheless described as the best exampe of an Iron Age sword ever found anywhere. Next door was a gallery of newer material on pre-Roman Britain and Europe, followed by one on Roman Britain. This contained lots of mosaics, Roman coins, sculptures, armour, and more. The next two galleries covered Europe in the Dark Ages and the Medieval era. These included Viking artefacts: shields, drinking horns, helmets, coins, and so on. 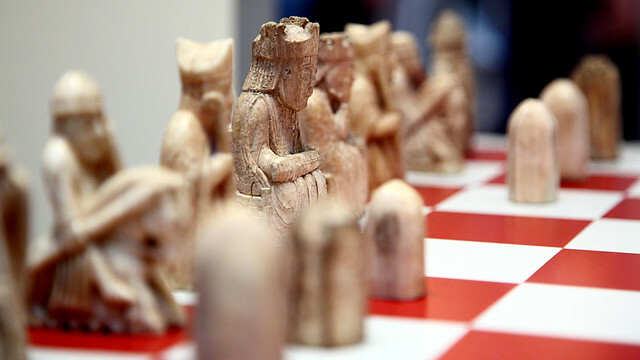 The prize here was the famous Lewis Chessmen, the oldest known chess pieces in existence, carved beautifully from walrus ivory. Seeing these in the flesh was a real treat. By this time we were getting hungry, so broke for lunch. We went out of the museum and across the road to the Forum Cafe and Sandwich Shop. M. had cheese and tomato on a baguette, while I had pastrami and melted emmentaler cheese on rye. It came with mustard and, I was expecting (from a description on the menu), salad, but there was no salad to be seen. It was very expensive for what we got, and not completely filling. I grabbed an apple for an extra 50p on the way out and ate it before we re-entered the museum. 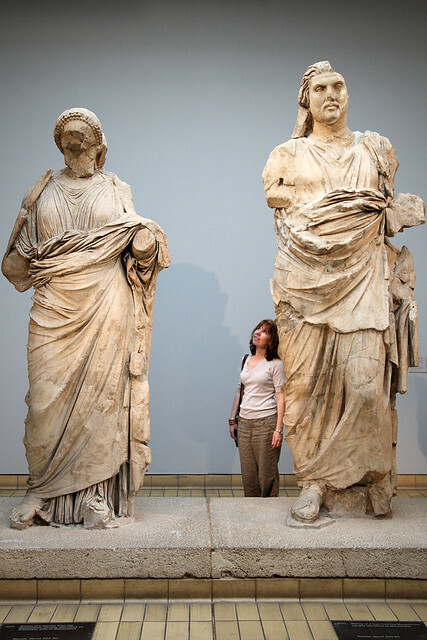 Back in the museum, we visited the remainder of the Greek and Roman sculpture galleries, which included several very large marble statues and many pieces of a large Greek mausoleum, including sculptures and relief carvings that ran around the outside. This completed the ground floor except for a themed exhibit on Enlightenment that we passed through briefly on Friday, an which resembled a large library with very few actual artefacts. So we skipped that and headed upstairs to peruse the other galleries on Greek and Roman artefacts, which included piles of coins, small figurines, and a whole room full of classical Greek vases, urns, and other containers painted in the black and brown style with scenes from mythology. There were also plenty of smaller sculptures, busts, and cast statues that were too small for the monumental statuary of the ground floor galleries. An adjacent gallery held Etruscan objects from this pre-Roman Italian civilisation, with their distinctive armour, helmets, and sculptural style. The galleries led us through time, but we'd already seen the Middle Ages periods along the other side of the building, so we came abruptly to 17th century, 18th century, and later objects. 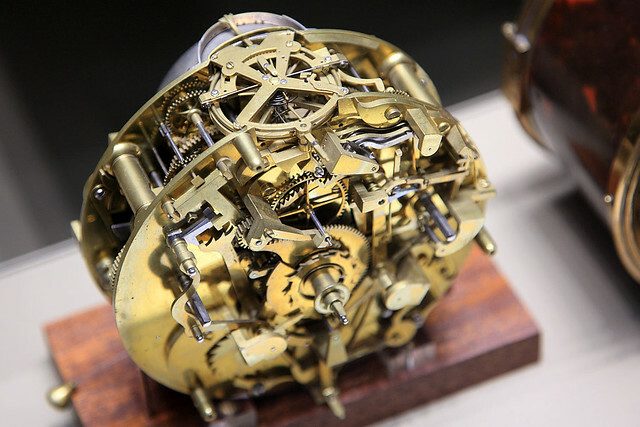 There was a large collection of clocks and watches, concentrating on the earliest examples, but with a few very modern ones as well. There was also a themed gallery of money, from the earliest examples of shells and shaped stones, through coinage of many types, to modern banknotes and credit cards. A woman was stationed at a table with examples of various types of money for people to touch and feel. She had an Australian $10 note - of similar wear to the one in my wallet, which I pulled out to compare. There was a large bronze ingot weighing about 2 kg and a gold coin from 11th century Persia, as well as a tiny gold dollar from the California gold rush of 1849. It was awe-inspiring actually getting to hold a 900-year-old gold coin. We finished with the 18th and 19th century Europe galleries, which displayed a cross-section of design and ornamentation in tableware, containers, furnishings, and decorative items. Although they could have been very interesting in their own right, they suffered from such close comparison to the vast quantities of truly ancient things nearby in the museum. Along the way somewhere we also ventured through some of the Asian galleries, with exquisite works of jade carving, giant Buddha figures, decorated vases, wall paintings, statues of animals, and so on. All in all, we'd spent a full day and a half in this vast museum, and only seen a selection of the galleries - there were several more on Asia and some themed galleries that we never saw at all - and in some of the ones we had seen, we had rushed through rather quickly, overwhelmed by the sheer number of items on display. Many of the cases contained dozens, if not a hundred or more small items, each worthy of examination and study. 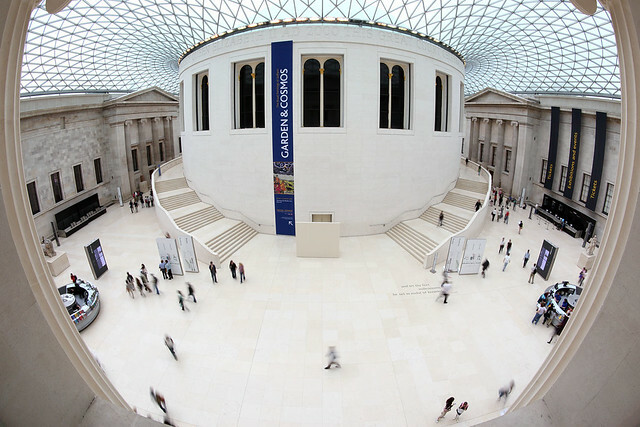 To have given every single item just 5 seconds of attention would have meant hours in each of the hundred-odd galleries. You could spend a week in this museum and still not see it all. In the end, we felt we'd done a good job with the time that we had available. We'll just have to come back one day! We're just taxiing for take-off on our first leg of the long haul home - a 12:20 flight to Kuala Lumpur. Disturbingly, the display screens were just showing computer operating system error messages. Less disturbingly, they were Unix and not Windows. After finishing the museum displays around 16:00, we had a quick look in the museum book shop for a souvenir guide to the collection. We bought a thick book which looked the most comprehensive, but it clearly describes and illustrates only a teeny teeny fraction of al of the objects we'd seen. We headed back to our hotel to pick up our luggage and then took it along Euston Road to King's Cross-St Pancras Underground station. I got extensions on our Oyster cards to take us as far as Heathrow and we boarded a service directly there on the Picadilly Line. It was slower than the dedicated Heathrow Express from Paddington, but £13 each cheaper, and didn't involve changing trains. We had fortunately got on about 10 minutes before 17:00, so peak hour hadn't really kicked in yet. We managed to get seats on the train and at no point did it get truly crowded. The journey took a few minutes short of an hour. At Heathrow, we were some 4 hours early for our flight departure time. But the check-in desks were open so we checked in and gladly dropped off our large luggage. We were also early enough to score exit row seats again - yay! The next step was to get the VAT refund form for M.'s leather jacket stamped. The counter had a queue stretching through four switchbacks, then along the terminal building, out the door, and partway along the exterior of the building! A helpful man near the end of the queue pointed out that if we had the VAT item with us as hand luggage, there was another counter past the security gates. So we skipped the queue and went upstairs to the departure lounge area. I had a bit of a drama at the security check after putting my watch aside to go through the x-ray machine. Only about 20 minutes later as we started eating dinner did I notice that I hadn't retrieved my watch! I checked the bags with us, but didn't find it in any of those. I remembered removing my watch and placing it in one of the plastic bins to be x-rayed, but just never picked it up again. I raced back to security to see if they had it, but it wasn't there. Concluding sadly that someone must have seen it and pocketed it, I returned to eat my Moroccan lamb tajine - which was very good by the way. I consoled myself that it was a fairly cheap watch. A second search of our bags didn't turn up the watch. But when we'd finished eating, a third search of our bags found it hiding in the folds of M.'s new leather jacket! So in the end, it was all okay. We wandered around the shops in the terminal a bit. M. bought some biscuits from the Harrod's shop as a gift, and I got a slice of carrot cake for dessert after the dinner. Then we basically relaxed until it was time for our flight. Last updated: Friday, 18 January, 2019; 15:56:08 PST.